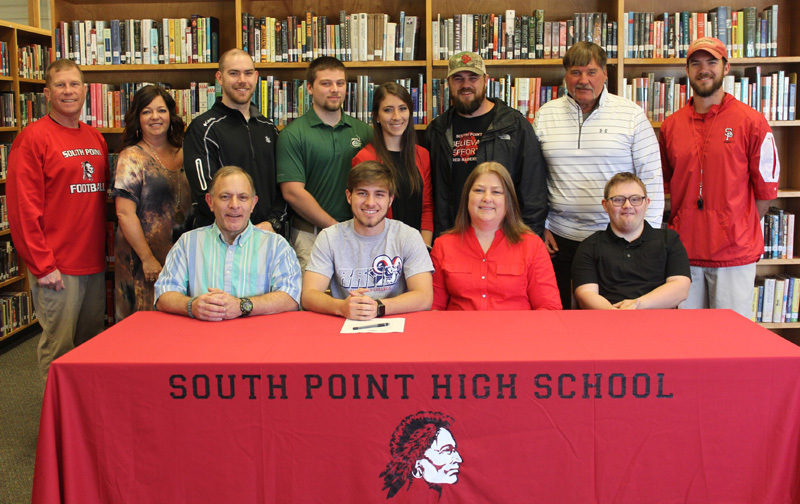 South Point senior Caleb Gibson, front row, has signed a national letter of intent to play football at Bluefield College. Front row from the left are his father, Chip Gibson; Caleb; his mother, Sharon Gibson; and his brother Trey Gibson. Back row from the left are South Point Athletic Director, Kent Hyde; South Point Assistant Principal, Stephanie Denton; South Point Offensive Coordinator, Josh Justice; Caleb's brother, Garrett Gibson; his sister, Leah Brooks; South Point Head Football coach, Adam Hodge; former South Point head football coach, Mickey Lineberger; and South Point Defensive Backs coach, James Justice. 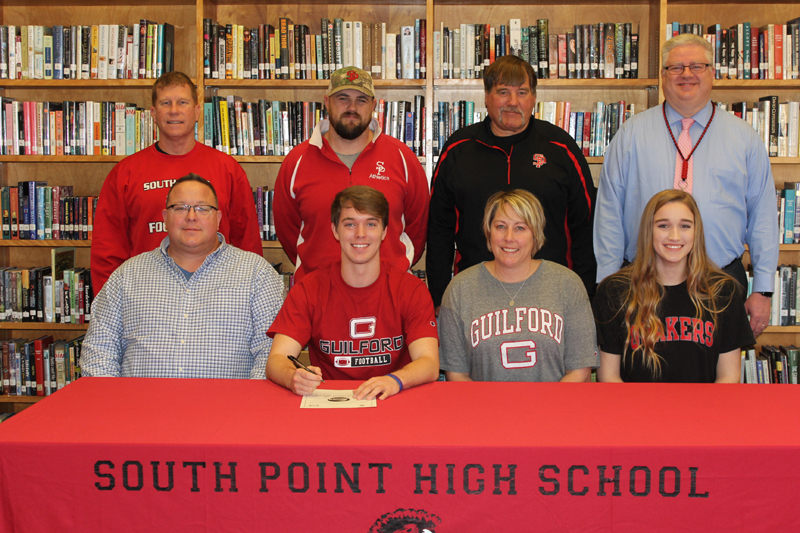 South Point High School senior Cade Ratliff has signed a national letter of intent to play football for Guilford College. Pictured, from the left, on the front row are his father, Chad Ratliff; Cade; his mother, Carol Ratliff; and his sister, Chloe Ratliff. On the back row are Kent Hyde, South Point High School Athletic Director; Adam Hodge, South Point High School head football coach; Mickey Lineberger, former South Point High School head football coach; and Gary Ford, South Point High School principal. 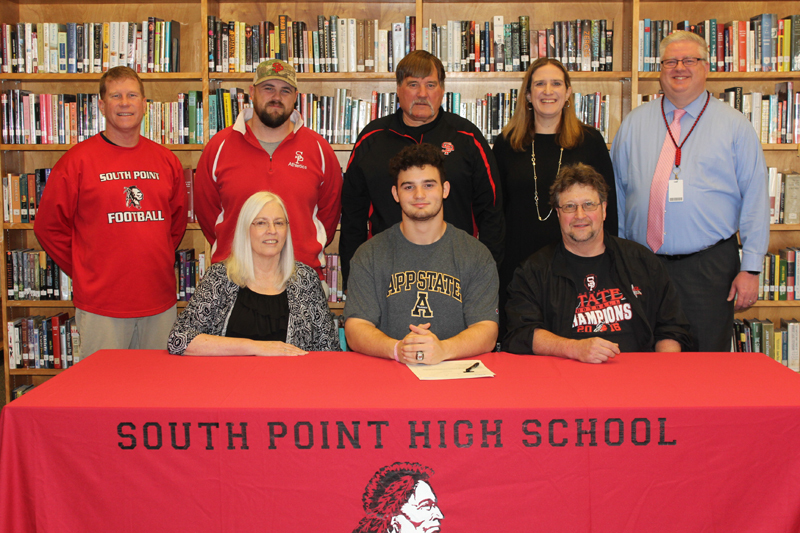 South Point High School senior Larry Dowdy has signed a national letter of intent to play football for Appalachian State University. Pictured, from the left on the front row are Larry's mother, Deann Biggerstaff; Larry, and his father, Larry Biggerstaff. On the back row are Kent Hyde, South Point High School Athletic Director; Adam Hodge, South Point High School Head Football Coach; Mickey Lineberger, former South Point High School Head Football Coach; Melissa Glover, South Point High School Choral Director; and Gary Ford, South Point High School principal. 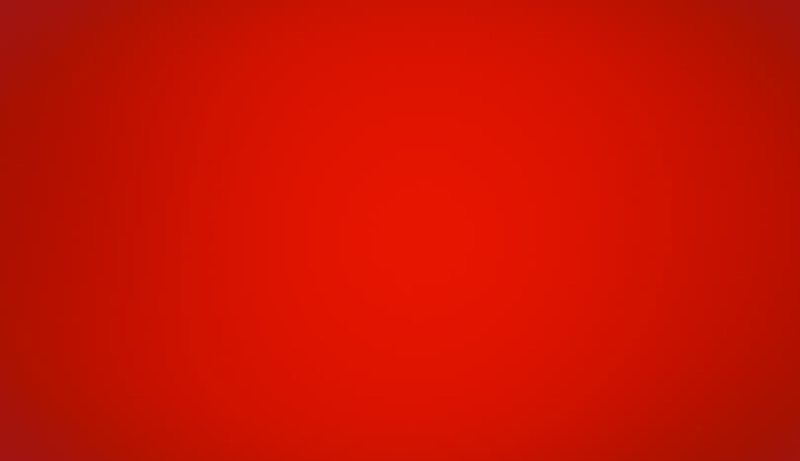 "2018 Red Raiders - All On The Field, Together"
Football seasons begin and football seasons end. This will never change. Games are won, games are lost, champions are crowned, and challengers are applauded. These too, are facts that remain. What does change year after year is the group of young men that come together to become a team, dedicated to a purpose and determined to work toward a common goal. Such desire requires a special character and attitude. And while most teams will realize a close to a season long before expected, true champions establish legacies of success worthy of emulation. For the 2018 South Point Red Raiders that legacy of success will be measured in their remarkable embrace of the team concept and their everlasting determination to battle to the end. This group, more than any opponent they faced, supported each other as teammates, and left every ounce of fight they could muster, on the field. Hall of Fame Chicago Bears running back, the late great Walter Payton once stated, "I want to be remembered as the guy who gave his all whenever he was on the field." This season, South Point boasted an entire team with that attitude. 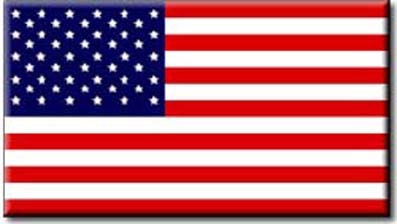 For their support we express, with sincere Raider pride, our appreciation for our Seniors, Tré Glenn, Keaton Hale, Zane Andrews, Chancellor Mayfield, Caleb Gibson, Tanner Canterberry, Josh Hicks, and Josh Bogen. We acknowledge the effort of Seniors, Nolan Cochran, Aryn Moore, Dalton Rhodes, Alec Moore, Larry Dowdy, Dylan Burton, Cade Ratliff, and James Cady. These young men accepted challenges, learned lessons, and eagerly accepted the responsibilities to act as leaders to guide their teammates. 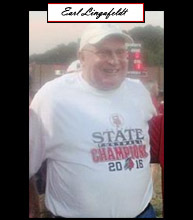 They were fine examples on and off the field, admirably defining the South Point Red Raider. Their presence on the field will be missed, but they have taken their place in a storied history among South Point greats. 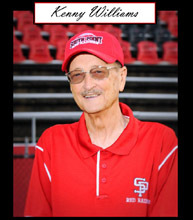 For this reason, they will always remain Red Raiders, so long as the pads are strapped on and the red helmets are donned in Lineberger Stadium. Seasons begin and seasons end. Sometimes, in football, the highest attainable goal is unreached. But often what is accomplished during the journey proves to have more lasting value. The 2018 season ended earlier than hoped for the Red Raiders, but thanks to a devoted group of young men, the program maintained a high level of respect from opponents. As a team, they came together, taking the field with a common purpose and intense dedication to a goal. And as a team, they left the field knowing that their hearts remained behind, that every ounce of fight had been expended for the cause. These are the marks of an outstanding group. These are the marks of the 2018 South Point Red Raiders! Tradition upheld! Still proud to wear the Red! With each passing season, the talents of a team may vary. Physical abilities such as speed, size, and power may change. 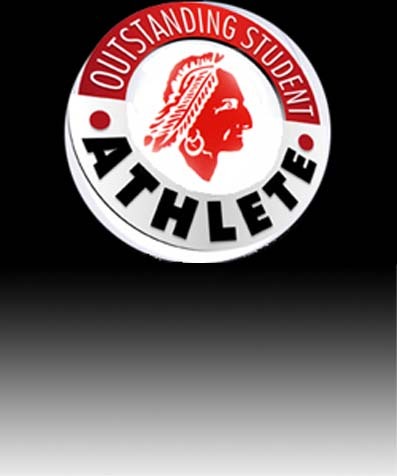 But one thing that remains in the South Point football program is the outstanding character and devotion…of EVERYONE! 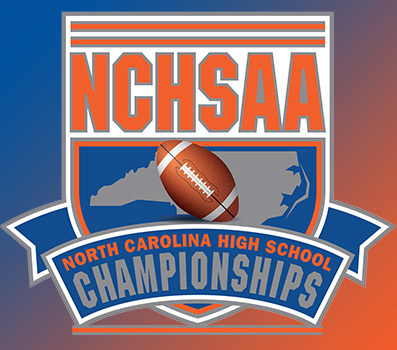 Thank you RaiderNation, Volunteers, Coaches! 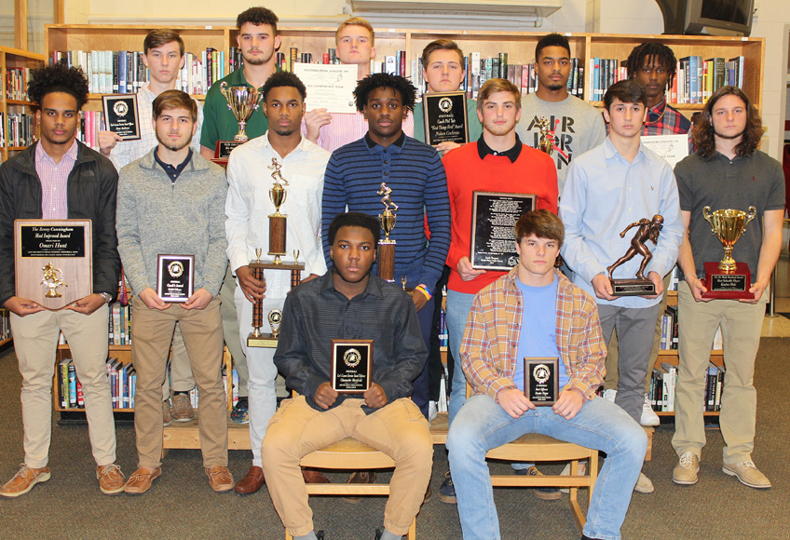 Third Row - L-R - Zane Andrews - Lee's Lawn Service Scout Offense Award; Larry Dowdy - Dr. Eddie Lineberger Best Blocker Award, All Conference & Gerald Cortner Character, Leadership & Scholarship Award; Peyton Chaney - All Conference; Nolan Cochran - Coach Phil Tate 'First Things First" Award & All Conference; Ray Grier - Sheila M. Rollins Memorial Co-Most Versatile Award & All Conference; Tre` Glenn - All Conference.